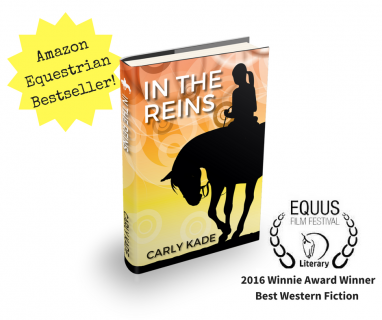 PHOENIX - Nov. 21, 2016 - PRLog -- The EQUUS Film Festival has named author Carly Kade as the 2016 WINNIE Award winner in the Best Western Fiction category for her novel, In The Reins. The award was presented in New York City on Sunday, November 20th at the fourth annual EQUUS Film Festival. The EQUUS Film Festival is the leading showcase for domestic and international equestrian content including feature films, shorts, documentaries, music videos, commercials, training, educational materials, art & literature. The selected authors and their literary works competed last week for the chance to win a WINNIE Award viewed as the EQUUS Film Festival's equine equivalent of the Oscars. "The EQUUS Film Festival is an excellent platform for bringing the storytellers of the horse world together through films, documentaries, videos, art, music and literature," said Carly Kade, Author of In The Reins. "I am honored that In The Reins, my novel for horse lovers, earned the 2016 EQUUS Film Festival's WINNIE Award for Best Western Fiction." Not your typical cowboy romance, In The Reins is based in modern cowgirl culture for readers who enjoy equestrian stories with a message similar to The Horse Whisperer by Nicholas Evans, The Longest Ride by Nicolas Sparks, or Flying Changes by Sara Gruen. Set in modern Western culture, In The Reins (http://amzn.com/0996887903) is the story of a city-girl-gone-country, a handsome cowboy and a Paint Horse brought together by fate. The leading lady's journey of self-discovery begins when she unexpectedly falls for the enigmatic Quarter Horse trainer, and then grapples with who he really is, where he goes when he disappears, and what it is that everyone doesn't want her to know about him. A book with a left hook, readers ride along as the wannabe cowgirl learns whether or not the man, harboring a deeply guarded secret, can open himself up to the woman sitting in the saddle beside him. Romantic and suspenseful, In The Reins captures the struggle between letting life move forward and shying away from taking the reins. Since its release at the end of 2015, In The Reins, a cowboy romance novel inspired by the equestrian lifestyle, has steadily climbed the charts to rave reviews. The book has been an equestrian best seller on Amazon for more than 10 weeks. The novel is available now in paperback and eBook on Amazon. Go behind the scenes of the 2016 EQUUS Film Festival with Author Carly Kade or view the In The Reins book trailer at www.carlykadecreative.com/media-room (http://www.carlykadecreative.com/media-room.html). Carly Kade is an Arizona-based equestrian author. In her free time, Carly enjoys competitively showing her registered Paint Horse, works on her next novel, reads voraciously, and loves exploring the great outdoors. Connect with Carly Kade Creative on Facebook or Twitter @carlykadeauthor.